The Twins have claimed outfielder Michael Reed off waivers from the Braves, per MLB.com’s Rhett Bollinger (via Twitter). He was one of several 40-man casualties of the Atlanta organization. Reed, 26 in November, was a fifth-round pick by the Brewers in 2011 and at times rated as one of the better farmhands in the Milwaukee system. His bat seemed to stall upon reaching Triple-A as a 23-year-old in 2016, though, and he took another step back at Double-A in 2017 — prompting his exit from the organization. Reed latched on with the Braves on a minor league deal last winter though and absolutely erupted in Double-A and Triple-A, raking at a combined .342/.453/.520 pace with 11 homers, 26 doubles and 10 steals in 401 plate appearances (with better performance in Triple-A than in Double-A). He appeared in seven games over a pair of big league stints with the Braves but never got much of a look at the MLB level in Atlanta. Reed’s minor league output, though, was fueled by ludicrously high BABIP marks (.426 in Double-A, .477 in Triple-A), so it’s no wonder that the Braves organization wasn’t fully enamored of his gaudy numbers. 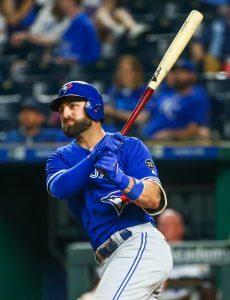 Still, he showed a keen eye at the plate (15.3 percent walk rate), didn’t post alarming strikeout totals (24.3 percent) and is capable of lining up in all three outfield spots. The right-handed-hitting Reed is out of minor league options, so he’ll have to stick on the 40-man roster all winter and break camp with the team or else be exposed to waivers once again. That, it should be noted, is far from a certain outcome. The Dodgers announced that they’ve selected the contract of catcher Rocky Gale from Triple-A Oklahoma City and moved right-hander Brock Stewart (right oblique strain) to the 60-day disabled list. Gale, whom the Dodgers signed to a minor league contract last offseason, hit .281/.305/.383 in 318 plate appearances with Okahoma City this year. The 30-year-old previously saw MLB action with the Padres in 2015 and ’17, though he only totaled a combined 20 PAs in those stints. The Braves have selected infielder Ryan Flaherty from Triple-A Gwinnett and placed outfielder Michael Reed (left lower back strain) on the 60-day DL, per a team announcement. Flaherty’s back in Atlanta not long after it outrighted him Aug. 23. The veteran has struggled across 172 PAs this season as a member of the Braves, with whom he has hit .222/.298/.301.